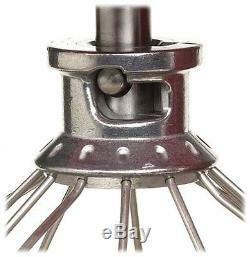 HEAVY DUTY STAND MIXER THE BOWL ELEVATES WITH A HANDLE FOR EASY USE. DOUGH HOOK IS ALSO INCLUDED AS WELL AS BEATER. 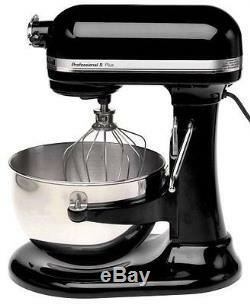 This stand mixer is one of the most heavy duty Professional mixers that kitchenaid makes. 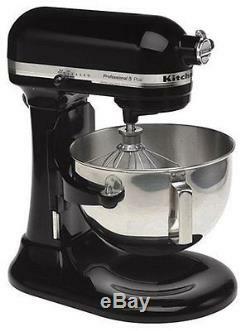 Thirty percent more powerful than KitchenAids previous 5-quart stand mixers, this professional model efficiently tackles heavy loads with its 450-watt motor, direct-drive all-steel gear transmission, and bowl-lift lever that effortlessly raises heavy ingredients up to the beater. KitchenAid stand mixers, constructed of durable die-cast metal, come in a variety of colors and styles that have become American classics. Assembled in Ohio, the mixer measures 16-1/2 by 12 by 14 inches. 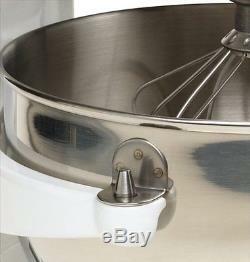 Whats In the Box Stand mixer; 5-quart stainless-steel bowl; flat beater; spiral dough hook; wire whip. The Professional 5 Plus has a powerful 450-watt motor that delivers enough power to handle the heaviest mixtures, and mixes large batches easily. This special bowl lift model has brackets on the bowl that fit over support pins on the stand mixer, which is than lifted up by a handle on the right side of the mixer to lock the bowl in place while mixing (this design is made to handle heavy mixtures and large recipes). The 5-quart polished stainless steel bowl is dishwasher safe. Its ergonomically designed handle is contoured to fit the hand and makes lifting the bowl more comfortable. This mixer also features a unique mixing action: the beater spins clockwise as the shaft spins counter clockwise, moving the beater to 67 different points around the bowl. This distinctive mixing action creates a thorough blend of ingredients and eliminates the need to rotate the bowl. 10 speeds allow the user to select the right speed for the mixing job, from very high to a very slow stir. 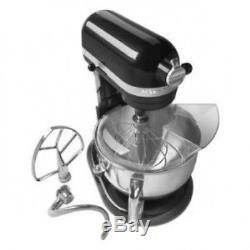 The flat beater, dough hook, and professional wire whip add to the versatility of the mixer. In addition, the Soft Start mixing feature helps prevent ingredient splash-out and "flour puff" at startup, while "Overload Reset" helps eliminate overheating of the motor. A hinged hub cover flips up, allowing easy installation of attachments and never leaves the mixer. From citrus juicer to sausage stuffer, KitchenAid stand mixers can handle just about any job in the kitchen. 450-watt motor with 10 speeds; 5-quart stainless steel bowl. Unique mixing action: beater spins clockwise as the shaft spins counter clockwise. Ergonomic handle makes lifting the bowl more comfortable. Hinged hub cover flips up, allowing easy installation of attachments. Measures 16-1/2 by 12 by 14 inches; includes flat beater, spiral dough hook, and wire whip. We do appreciate your five star feedback. Our client's privacy is very important. We guarantee that NO information collected by us will be. 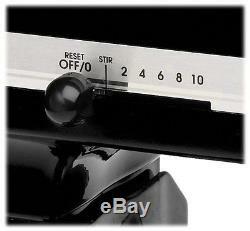 ATTENTION ALL CUSTOMERS: ALL ELECTRONIC ITEMS ARE 110V. The item "New KitchenAid Pro Big Stand Mixer 450-W 5-Quart Kv25gOXob All Metal Onyx Black" is in sale since Thursday, December 13, 2012.